This composite X-ray (blue and green) and optical (red) image of the active galaxy, NGC 1068, shows gas blowing away in a high-speed wind from the vicinity of a central supermassive black hole. Regions of intense star formation in the inner spiral arms of the galaxy are highlighted by both optical and X-ray emission. The elongated shape of the gas cloud is thought to be due to the funneling effect of a torus, or doughnut-shaped cloud, of cool gas and dust that surrounds the black hole. The torus, which appears as the elongated white spot in the accompanying 3-color X-ray images, has a mass of about 5 million Suns. Radio observations indicate that the torus extends from within a few light years of the black hole out to about 300 light years. The X-rays observed from the torus are scattered and reflected X-rays that are probably coming from a hidden disk of hot gas formed as matter swirls very near the black hole. The torus is one source of the gas in the high-speed wind, but the hidden disk may also be involved. X-ray heating of gas further out in the galaxy contributes to the slower, outer parts of the wind. Observations with the spectrometers aboard Chandra enable scientists to estimate the composition, temperature and flow velocity of the gas. They show that the composition of the material in the wind is roughly similar to that of the Sun's atmosphere, except for a deficit of oxygen atoms, and that it has a temperature of about 100,000 degrees Celsius (180,000 degrees Fahrenheit). The average gas speed is about 1 million miles per hour. 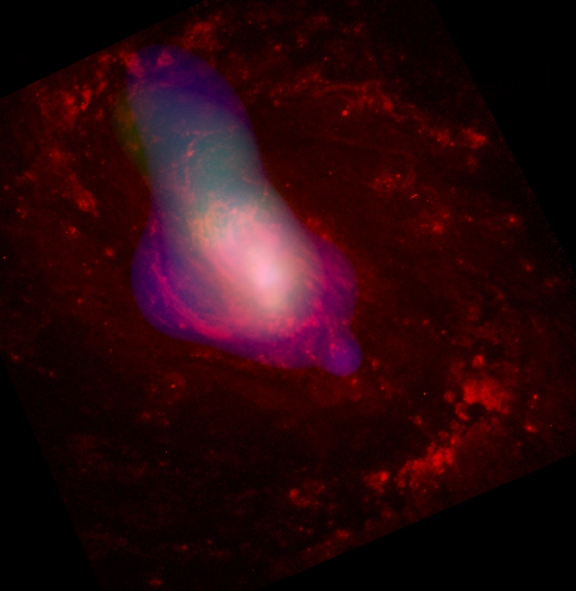 These Chandra data on NGC 1068 are consistent with a picture where the observer is looking along the edge of a torus of cool gas and dust around a supermassive black hole. In this case we see the indirect effects of the black hole, but do not get a direct view. In contrast, an observer looking down into the hole of the torus would see a brilliant black hole source (see NGC 5548, NGC 4151). Credit X-ray: NASA/CXC/MIT/UCSB/P.Ogle et al. 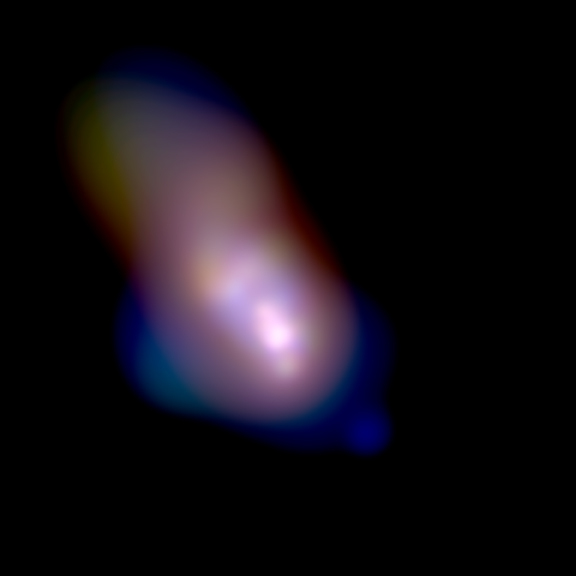 ; Optical: NASA/STScI/A.Capetti et al. Scale Image is 36 arcsec on a side.